This revival of Copenhagen is in safer hands than the secrets of nuclear fission during WWII. Michael Blakemore directed the multi award-winning original production of Michael Frayn’s play in 1998. Here he revisits the story of physicists Werner Heisenberg and Niels Bohr, and the latter’s visit to his old collaborator during the German occupation of Denmark. We begin on a “but” and an offbeat, as if Frayn and Blakemore themselves never left off reworking the problem of human motivation. Did Heisenberg come to be deterred from working on nuclear weaponry or to seek preemptive absolution? To suss out the competition or transfer moral burden? Or had he, perhaps, bluffed himself? Heisenberg’s uncertainty principle gains dramatic form as the pair pace in circles on asimple grey set evoking pure mathematical structure. Charles Edwards and Paul Jesson generate thrilling bursts of theatrical energy as the two old thinking partners collide. Spotlighting helps suggest that, while they may be extraordinary calculating machines, their ideas and memories are still coloured by human feeling. A video projection of an atomic explosion, expanding into the auditorium, reminds us of the external destruction wreaked when brilliant minds gain unbridled momentum. But Patricia Hodge’s Margrethe is the play’s still nucleus, “watch[ing] closely behind an expression of polite interest” and perceiving the father and son dynamic at play. 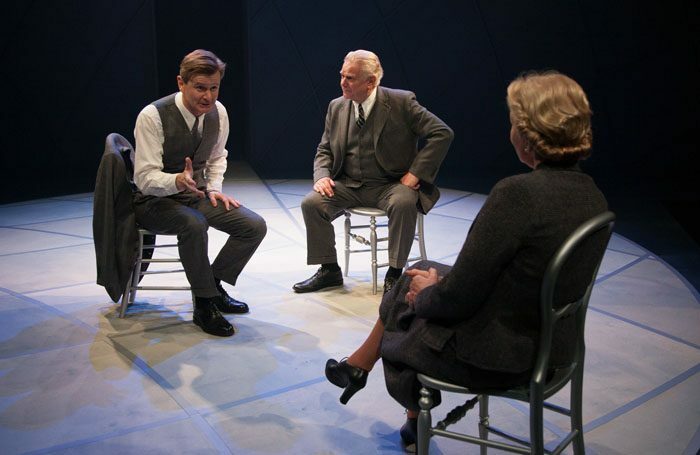 Hodge has more to give in the role of Bohr’s wife than there is room for in Frayn’s densely clever and coolly crafted play, with its investment in the excitement of a very male second Enlightenment.